What is a Skier's thumb? 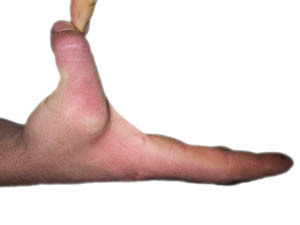 Skier's thumb is often referred to as gamekeeper's thumb. It is a tear of the ulnar collateral ligament of the metacarpophalangeal joint of the thumb (figure 1). The metacarpophalangeal joint is the joint where the thumb joins the hand and the ulnar collateral ligament lies on one side of the joint nearest the index finger. The ligament is important in stabilising the thumb when making a pinch with the adjacent index and ring fingers. Injuries to the ulnar collateral ligament typically occur when the thumb is forced away from the hand. This usually occurs during a fall, especially when something is held in the hand, such a ski pole which is why it is called a skier's thumb. A gamekeeper's thumb is a similar condition to skier's thumb. It is however not caused by a specific injury but it is due to a gradual lengthening of the ulnar collateral ligament causing it not to work properly. In the past this was commonly seen in gamekeepers who by repeatedly wringing the neck of birds to kill them lengthened the ligament. thumb pain - injuries of the ulnar collateral ligament typically cause pain with thumb use, especially pinch grip. The ligament can be sprained (a partial tear) or in more severe cases it can be completely torn. It is important to differentiate between a sprain of the ulnar collateral ligament and a complete tear as surgery is more likely to be required in a complete tear. This can usually be determined after a careful clinical examination, although in cases where this is not conclusive, an ultrasound scan may be helpful. Figure 2: photograph showing an unstable thumb after a complete ulnar collateral ligament tear. These usually only require a period of rest and immobilisation in either a cast or removable splint. These are usually treated surgically. In some people with a complete ligament tear a tendon near the thumb joint (the adductor pollicis aponeurosis) becomes trapped between the end of the torn ligament and the place that it should insert onto the bone. These injures require surgical treatment, ideally within 3 weeks of the injury, otherwise the ligament is unlikely to heal and long-term problems are more likely. The operation involves repairing the ligament through a small incision and it can be performed as a planned day-case procedure. Postoperatively the thumb will be immobilised for up to 6 weeks in a cast or splint. In most cases the ligament heals and there are no long-term problems. It is usual to have some stiffness in the injured joint, but this is unlikely to cause any problems. In some cases the result is less optimal and further surgery to either reconstruct the ligament or fuse the joint may be necessary.